Mindy Max Miniatures: Something different! Learning about the world of miniatures. 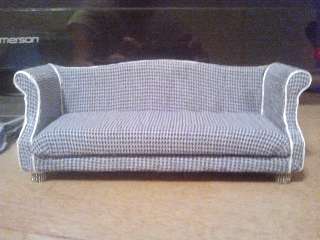 The above picture is what the couch should have looked like when I got it. The bottom cushion was almost faded white. I love it! I like the style of that sofa and I love the fabric and trimming you selected! Next time, perhaps you could remember to show the before pic. It's always fun to see what something looked like before the makeover. Thank you, Lucille! It is funny that you said I should have taken a before picture. Half way thru re-doing the couch...I remembered that I should have...lol! Let me see if I can at least find a picture of the original. Lovely work. It's great fun making things more the way you'd like to see them. Did you say you got covered in glue? Welcome to my world. Hi! I'm Mindy Max. I'm so happy that you stopped by to take a look at my blog. I'm a newbie in the world of miniatures. But, I have always loved them. I always wanted a real dollhouse growing up. I found my very first one and have been having a blast putting it together. 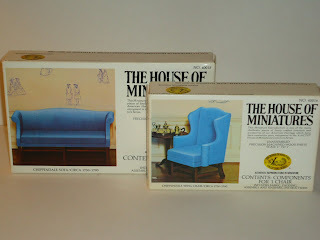 I have learned so much from so many others on the internet and other blogs on the do's and do not's of dollhouse building. I have always found so many things I would love to try myself. So, this is the reason for this blog. To learn and make to friends as I go along.